Can we take this opportunity to thank you all for your kindness in helping us receive this fantastic amount from the Asda green token scheme. 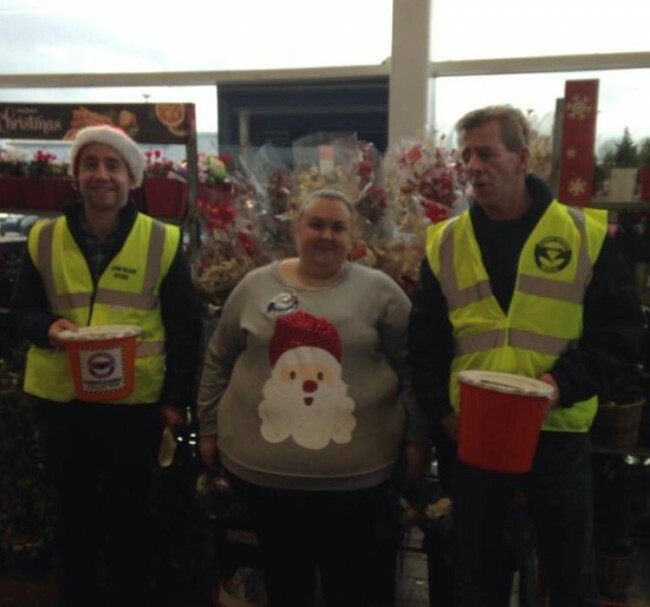 Pictured L/R Crew member Brian Lavery Barbara Logan (Asda community champion) Crew member Ivan Crozier. 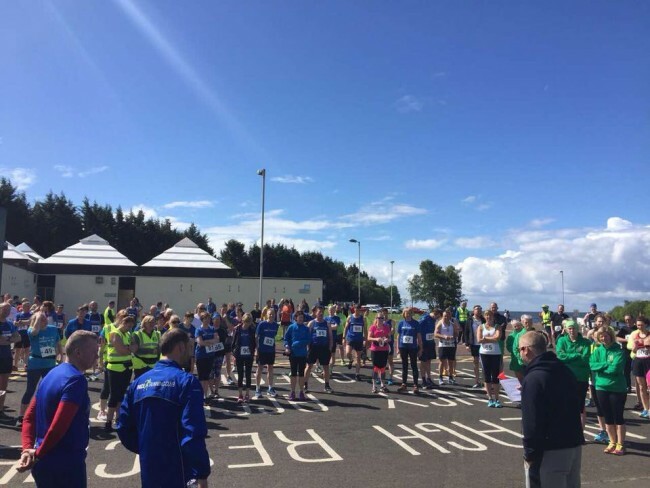 We are holding our 2nd annual 5 Mile and 10K run on Saturday 2nd June 2018. Run commences at 11.00am sharp. HM Coastguard paged LNR at 12:29 and requested that a search be undertaken at the River Bann Foot for a missing person. The lifeboat launched and proceeded to the area to commence searching. With the search yielding no results on the day HM Coastguard stood down the teams. In the coming days and weeks further searches were undertaken by LNR and other agencies until the person was located. The thoughts and prayers from all in LNR are with the individual’s friends and family. 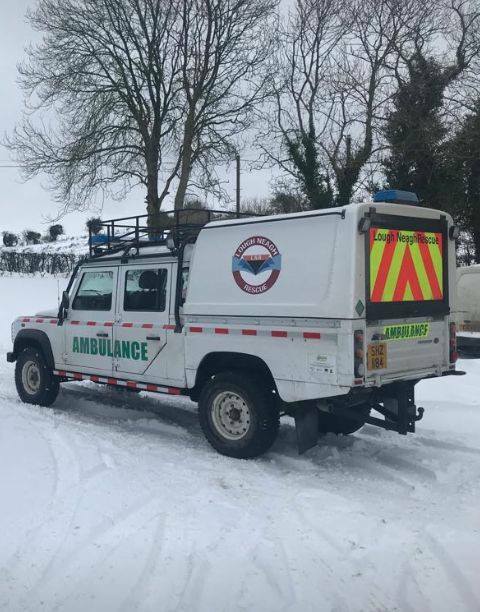 As 2017 draws to a close we would like to take this opportunity to congratulate our Honorary Member Paddy Prunty upon receiving his BEM Honour from the Queen for his services to Lough Neagh Rescue. Tonight we helped deliver Santa safely to the Steeple estate in Antrim, where the Steeple community association held their annual Christmas light switch on. Thanks for inviting us to help Santa, I hope we get an extra present under the tree. Can we take this opportunity to thank the members of Carnmoney Parish Men’s Society for the invite to give a talk about Lough Neagh Rescue. 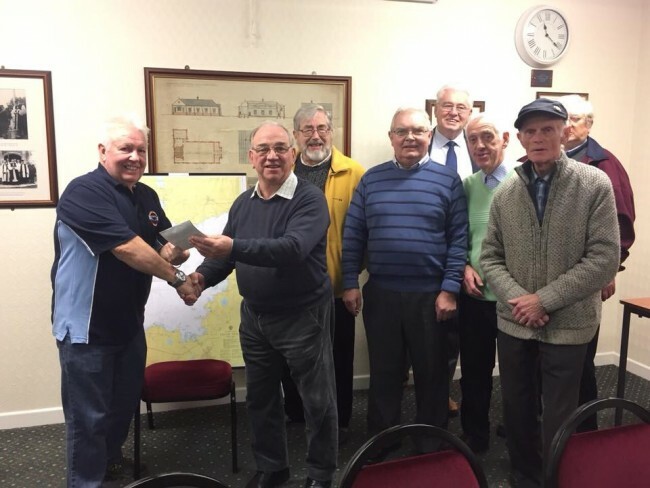 We were treated to a lovely fry and pictured below is crew member Desi Lundy excepting a small donation from those members present. 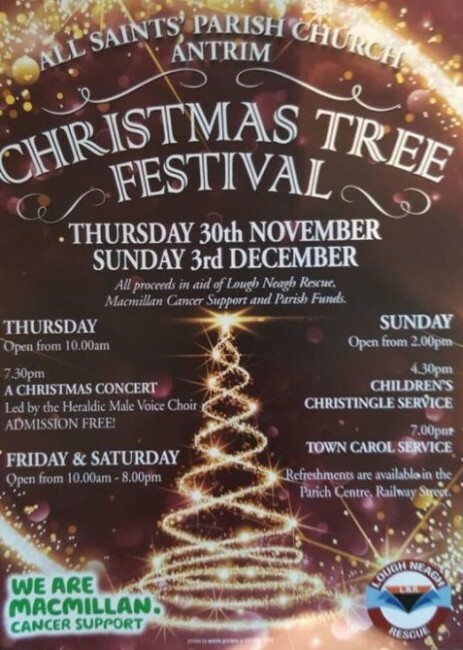 We are very lucky to be chosen as 1 of 2 charities for this years Christmas Tree Festival in All Saints Parish Church Antrim. Please share this event with all your friends and family and encourage them to come along and help support this wonderful event. At 17:28 HM Coastguard tasked LNR to a report of kayaker possibly in need of assistance in the area of Hog Park point. Ardboe and Kinnego lifeboats attended and after a search the casualty was located on shore. Tonight we had a visit from the County Antrim Paddle Sports. They had a tour of the facilities and the children asked some great questions in relation to water safety. In the summer they had a charity fund raiser called the Big Bann Challenge and monies raised this year where donated to LNR. A magnificent total of £500 was handed over tonight to help our lifesaving charity. Can we thank all the members of CAPS for the donation and for the continued support we receive. 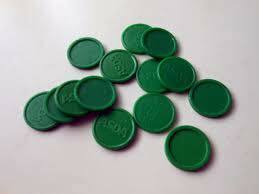 If you’re in Asda Antrim over the next few weeks please help us fund raise by putting your green tokens into our tray. Your help and support is very much appreciated. 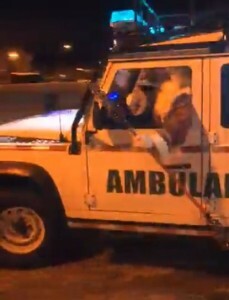 At 22:06 LNR were tasked by HM Coastguard to an incident in the NW area of the Lough. Lifeboats and Shore Crew attended. Convergys staff had a dress down day with proceeds going to a local charity. 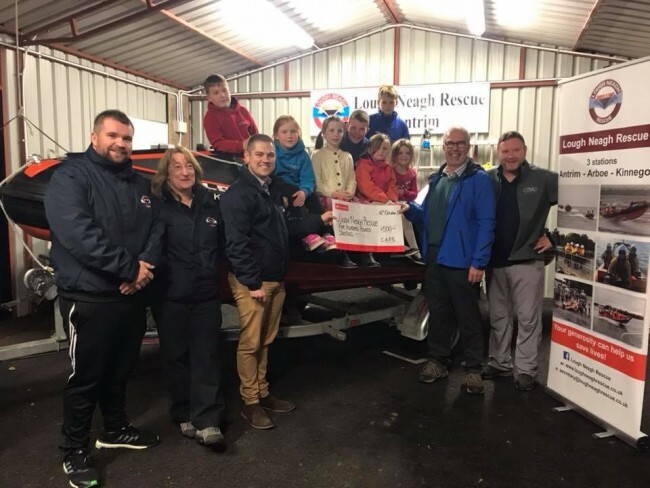 Lough Neagh Rescue were the chosen charity and for that we are very grateful. Staff managed to raise a whopping £170 from the day. As a charity, donations and support from the community, is crucial. A big thankyout to Ashley for thinking of and nominating us. 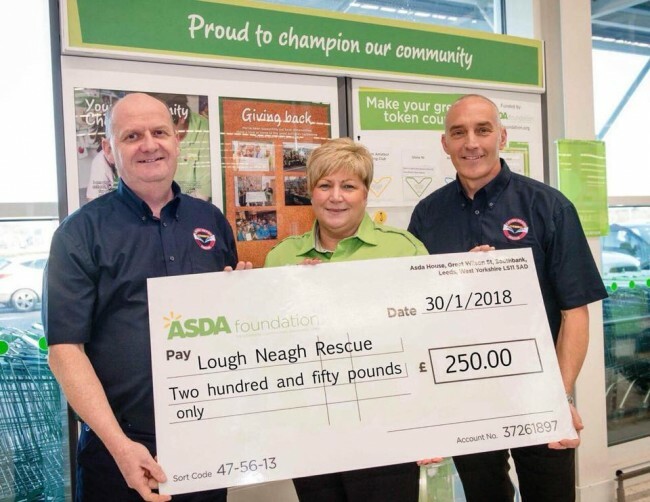 An amazing £135.00 has recently been donated by Conservation Service staff based at the Lough Neagh Discovery Centre to Lough Neagh Rescue, thanks to the sale of honey from their on-site Bee Hives. Due to the hard work and dedication of the staff, and the bees 27 jars of delicious honey was produced from the three bee hives that the Conservation Service staff look after – and council staff were offered the exclusive opportunity to get their hands on it! A donation of £5 per jar was suggested with all jars snapped up in no time. Thanks to everyone who generously donated and we hope you enjoy your honey! At 09:49 HM Coastguard tasked LNR to a lost 16ft Fishing Boat with 2 Persons onboard. Ardboe & Kinnego Lifeboats launched. Ardboe Lifeboat located the boat and provided assistance. 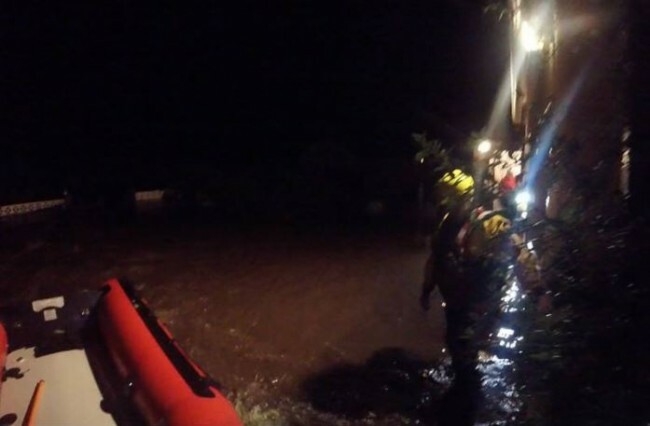 Both lifeboats then returned to base. 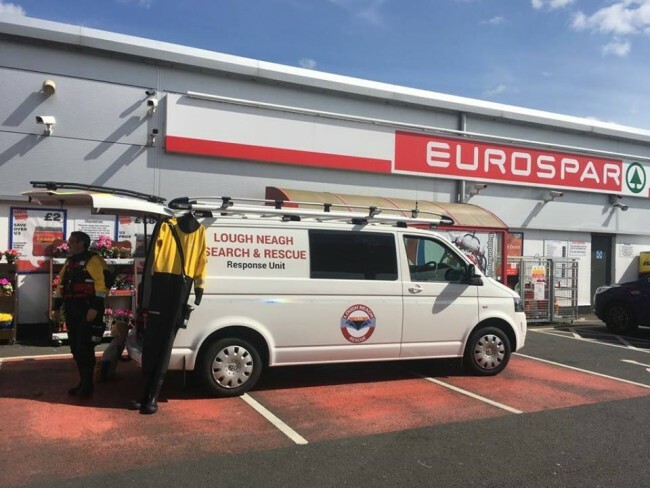 Lough Neagh Rescue are currently collecting at Eurospar in Lurgan. If you are out and about come say hello to our crew, have a look at our equipment and ask us any questions. Following a 999 call HM Coastguard tasked LNR at 17:15 to search for a vessel with 2 adults and 2 children on board which had hit rocks and was now aground North of Ballyronan Marina. All onboard were wearing lifejackets. The Ardboe lifeboat launched and proceeded to the area. Upon arrival, a short search commenced and the casualty vessel was located in Rushy Bay. The Lifeboat proceeded with caution to the casualty vessel and when alongside transferred the 2 adults and 2 children onboard the lifeboat. With the consent of the skipper a tow line was connected to the casualty vessel and the lifeboat proceeded to tow it into Ballyronan marina. The vessel was safely moored to the jetty and the persons on board the lifeboat handed into the care of the awaiting Coastguard team on shore. The Ardboe lifeboat then returned to base. At 13:40 HM Coastguard tasked LNR to a lone kayaker who had been thrown off his sit on kayak in Antrim Bay. The casualty tried to get back on however became exhausted. 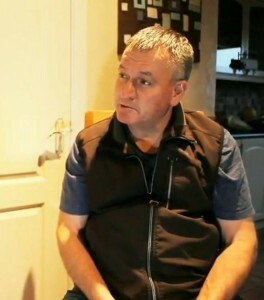 A member of the public had contacted the Coastguard. Antrim Bay Lifeboat launched and quickly arrived on scene and retrieved both the casualty and kayak. The Casualty was shaken but ok. Safety advice was given and the Antrim Bay Lifeboat was stood down and returned to base. At 13:12 HM Coastguard tasked LNR to a vessel in Kinnego bay which had engine difficulty, Kinnego Lifeboat launched and brought the vessel safely to shore. 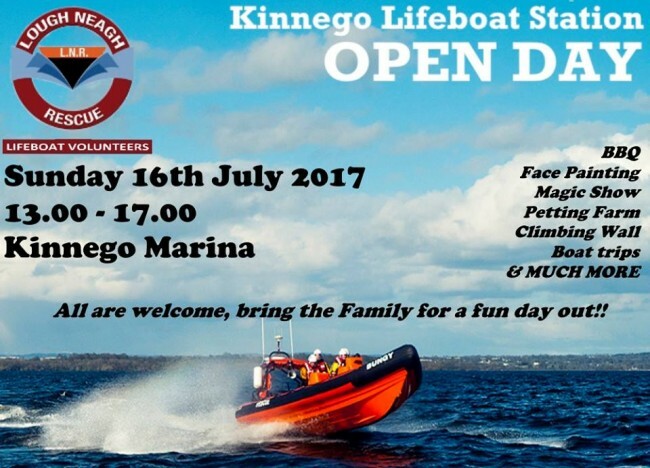 Kinnego Lifeboat returned to base. Following a telephone call from a casualty vessel to one of the LNR crew at 15:45, LNR contacted HM Coastguard to seek approval to launch to the assistance of a vessel with 3 persons on board south of RAMS Island. All persons on board were wearing lifejackets and were in no immediate danger. Approval was obtained and the Kinnego lifeboat launched to the casualty, attached a tow line with the consent of the skipper and towed the vessel safely to Bartons bay. Kinnego lifeboat stood down and returned to base. In the early hours of this morning at 01:10hrs HM Coastguard received a 999 call from person on-board a yacht which had 2 persons on-board whom have become disorientated and not sure of their current position in the darkness. The Ardboe & Kinnego Lifeboats launched and commenced an extensive search. HM Coastguard also requested the assistance of Rescue 116 (Irish Coastguard SAR helicopter). Whilst on a running line between Oxford Island and Ballyronan (searching northwards) the Ardboe lifeboat located the casualty vessel, made contact, came alongside and one crew member boarded to assist the skipper in dropping the sails. The Kinnego lifeboat proceeded from its search area on the eastern shore to the location of the casualty vessel. 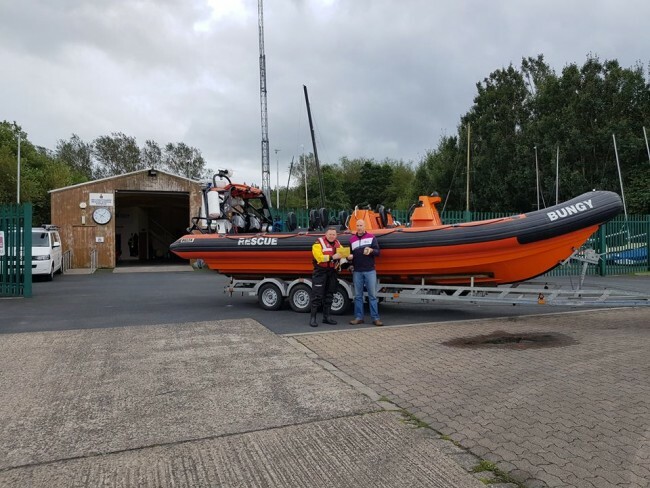 Whilst alongside a tow line was attached to the vessel (with the consent of the skipper) and the Kinnego lifeboat commenced a tow to Kinnego marina with one crew member on-board the casualty vessel. Both Rescue 116 and the Ardboe lifeboat stood down and the lifeboat returned to base. The casualty vessel was brought safely alongside the jetty in Kinnego Marina by the Kinnego lifeboat and the casualties were handed into the care of the awaiting Coastguard team. 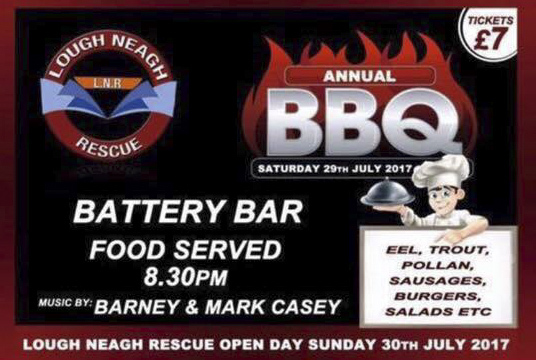 As Summer approaches Lough Neagh Rescue will be hosting our annual open days. First up is Kinnego station on Sunday 16th July at 1pm. 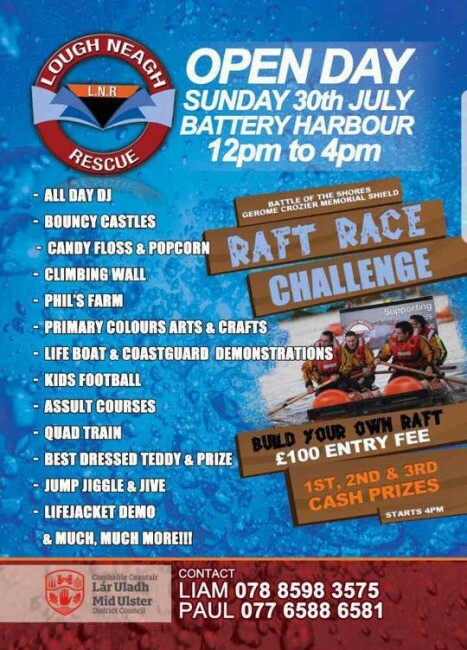 This is an opportunity for us to thank you all for your continued support but also a chance for you to come have a look around our station, meet our crew and have a fun filled family day out. We look forward to seeing you there. At 20:43hrs HM Coastguard tasked LNR to reports of persons entering the water in search of a few canines in the Antrim Bay area. The Antrim Bay lifeboat, Ardboe lifeboat and land mobile unit Lima Romeo (with shore crew) responded. The Antrim Bay lifeboat located the casualty whom was taken safely to shore by the shore crew, the Ardboe lifeboat also arrived on scene with all units being stood down shortly thereafter. The casualty and the canines were safe and well. At 19:34hrs HM Coastguard tasked LNR to a white boat with 4 persons on board believed to be in the area of Maghery, the casualty vessel was experiencing engine trouble and was drifting. The Ardboe and Kinnego lifeboats launched and proceeded to the area where the casualty vessel was located west of Colmkille Point and was aground. 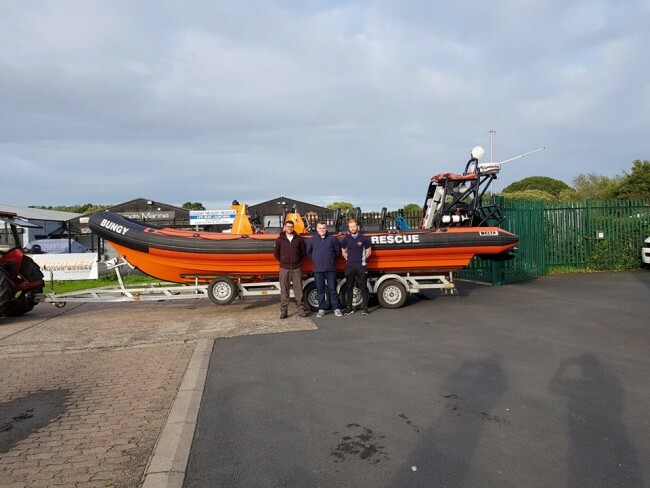 A lee shore rescue was initiated, two crew entered the water and proceeded to the casualty vessel, the crew inspected the vessel for damage and as it was deemed safe to tow, a towline was connected with the consent of the skipper. Before commencing the tow, the 4No. casualties were transferred onto the Ardboe lifeboat with 2 No. lifeboat crew remaining on the casualty vessel. The vessel was towed into Magery where the casualties were handed into the care of the awaiting coastguard team. And the vessel was safely moored to the jetty. Lifeboats returned to base. Today we had a visit from our colouring in competition winners from Antrim Primary School. They received a tour of our Antrim Station and got to try some of our gear on. 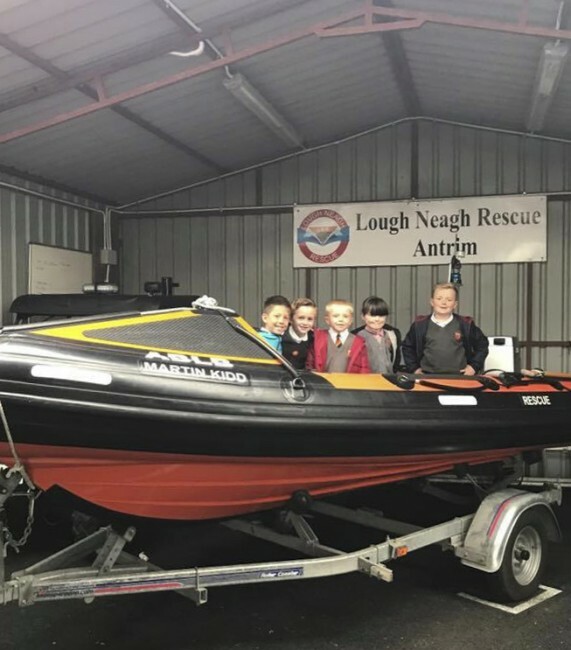 Can we take the opportunity to thank Antrim Primary School for all the support they have given to LNR this school term. At 14:12hrs HM Coastguard tasked LNR to Coney Island where it was reported by the Island Warden that 4 persons were stranded on the Island due to inclement weather conditions. Both the Ardboe and Kinnego lifeboats launched and proceeded to the Island. Upon the lifeboats arrival to the Island the crew liaised with the casualties and assessed their vessel. It was decided that the casualties would be brought onboard the lifeboat and transferred to Maghery, whilst in Maghery they were handed into the care of the awaiting local Coastguard team. All LNR units returned to base. Last Night, Friday 9th June 2017, at 23:00hrs HM Coastguard tasked the Ardboe lifeboat to a yacht with 2 persons on board, the casualty vessel had experienced engine difficulties near Ballyronan and requested assistance. The Ardboe lifeboat launched and proceeded search for the casualty vessel with the Kinnego lifeboat remaining on standby / immediate readiness. 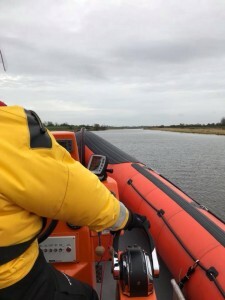 The casualty vessel was located approximately 1nm East of Ballyronan marina, one LNR crew member boarded the casualty vessel and a tow line was attached with the consent of the skipper. The lifeboat then proceeded to tow the casualty vessel into Ballyronan marina where it was brought safely alongside the jetty. 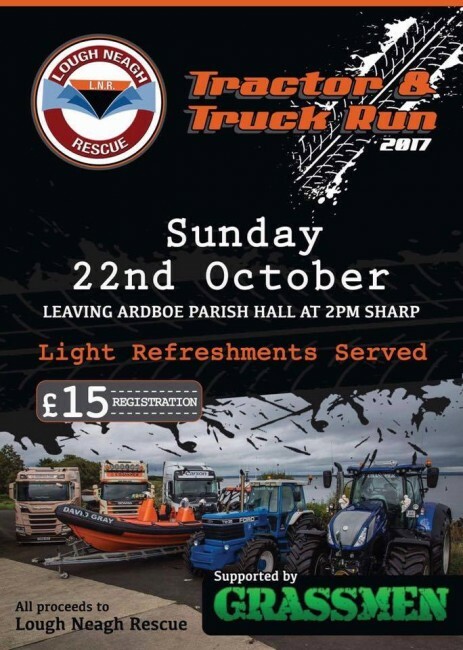 Ardboe lifeboat returned to base.